Drones are a technology seemingly defined by their particular ability to reside, almost exclusively, in air-space. Unlike conventional planes, they apparently do not rely on the ground, that domain of human life, for anything apart from their first breath. Just like satellites, once launched drones can float indefinitely. This is no-longer flight. Flying is what planes and birds do; flying is defined in relation to the ground. What drones do is more akin to an orbit of the skies, a low orbit, but even orbit does not have the same level of freedom as this. Orbit is held in a trajectory restricted, even if not entirely determined, by the cosmic body about which it occurs. Though of course affected by gravity, the drone resists it with lasting success. It may very well soon be the case that drones need never come down. Even birds must return to feed their young; drones are not weighed down by the mortal necessity of reproduction, and can feed off the near-immortal energy of the sun. And satellites, though they do not require fuel to remain, do require guidance to function. The ambition for drones is to transcend even this minimal level of dependence: to become ‘autonomous’, not only in a physical but also a mental sense; to develop the capacity to make decisions based on their own perceptions. It is even proposed, by the scientist Ronald Arkin among others, that these decisions could be not only logical, but ethical, thoughtful, calculations[i]. True, robotic autonomy was predicted in many-a-sci-fi dystopia, but what was not foreseen, as far as I know, is the significance of airspace autonomy; the combination of a highly-autonomous machine and a highly-independent space. We, the corporeal human, cannot directly approach the sky without the use of another technology – a plane or a jetpack – as we might approach the land by walking, or the sea by swimming. The independence, the privacy which the sky attains from this has a clear impact upon the ability for human legal control of these environments. Thus, since the sea is comparatively unapproachable, uninhabitable, maritime law has always been more difficult to enforce than the law of the land. Similarly, the law of the skies is found to be vulnerable because, although we can enter it, we cannot inhabit it – but even more so than the seas as, whereas we can swim for minutes; hours, we can only jump for a fraction of a second. Yet we must ask, as always, what does this idea permit or encourage? What are the effects of believing that at some point, if not already, we will not be able to control the drone or its corresponding space? I would argue that it is a belief laced with peril. It is perilous because it leads us to the false conclusion that a certain force, a geographical-legal principle, has entirely dissolved. This principle can be most simply expressed as that narrow-minded view of the world held by maps, and demonstrated by the colonial despots who, during the era of Empire, drew arbitrary lines on them to separate one’s land from another’s. The point is that this principle has not at all dissolved, and in fact resides at the heart of the very functionality of drone warfare itself. …It’s an entirely different attitude with drones over Karachi. The hypocrisy is beyond belief. Dawn is now reporting that security agencies want action for a complete ban on heli-cams (drone cameras) over Karachi for fear of surveillance operations by undesirables and turning small drones into explosive devices”. To the extent that drones are regarded as autonomous and free, their movement is apparently indiscriminate, they do not care for our earthly geographies, or the legal divisions – sovereignty being the most obvious – that accompany them. There seems to be a careless equality to the drone. Particularly as the smaller quadcopters and micro-drones become cheaper and more accessible to the general public, they express a liberal individualist sense of freedom. But this naivety leads us to pay scant attendance to the continuing inequalities of power through space. In terms of geographical-legal discriminations in the waging of drone warfare, we are usually given the bare minimum of analysis: that simple binary of a Western nation regulating drones in its own skies whilst raining down Hellfire from another’s. And even this, it is reckoned, might disappear with the proliferation of drones into the hands of ‘lone wolf’ insurgents. But of course the governments realise their hypocrisy, and they will not let its principle of discrimination dissolve so easily. As we have already seen, the threat of equality that drones pose will be countered, quashed with ever-stricter regulation: Geographical-legal regulation, like the ‘no-fly zones’ proposed in Washington after a small unarmed drone landed on the White House lawn late last month, and now, as Grayson observes, in Karachi[ii]. The response to a so-called democratising technology will, as we are gradually seeing with the internet, be an increasing proliferation of more authoritarian divisions and blockades. The ‘double standards’ to which Grayson refers are thus geographical-legal by nature, and the case of FATA draws attention to the regional or urban/rural order by which this hypocrisy often functions. 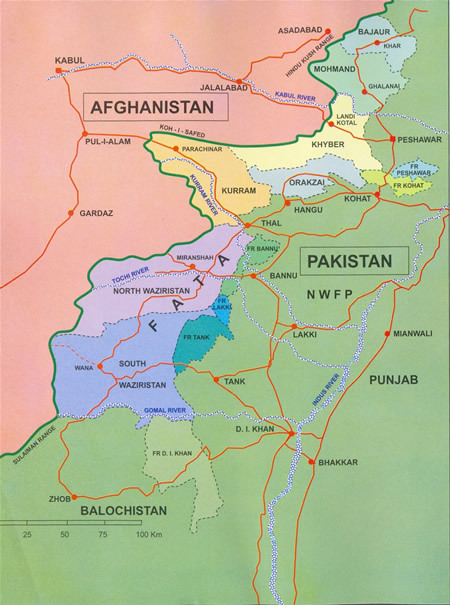 The Federally Administrated Tribal Areas are, as Shaw and Akhter have explained in detail, an exceptional space. They have, since their status as a frontier region of the British Raj in the 19th century, and in particular the imposition of the Frontier Crimes Regulations (FCR) in 1901, been constructed as a territory outside the normal legal order, a by-turn formal and discursive tradition upheld to this day by Karachi and Islamabad[iii]. It is with this concept of geographical-legal exception in mind that we should in fact regard all grants of ‘consent’ given by governments in those countries affected by US drone strikes. Because, whether a formal legal exceptionality exists as in FATA, it is nevertheless always the case that those geographies being targeted are isolated from those that give the go-ahead. In arguments that portray the whole state as victim, there is a failure to take into account the fact that, though the government may be under pressure from Washington or London, it is in turn the pressurising force in an inequitable relation of power with its own (rural) population. I propose that a vital precursor to appreciating these continuing geographical-legal orders of dominance and exception is to banish the notion that the drone and its airspace is autonomous or free in any true sense of that word. Regardless of the potential ability of the drone to act with reference to its own ‘intelligence’, what must be remembered is that the decisions that it makes are only required because we demand them. For any of you familiar with John Rawls’s Theory of Justice[iv], it may be helpful to reflect on one of the criticisms aimed at that work. In short, Rawls argued that his theory of justice, the theory of ‘justice as fairness’, was moral, and – until he was forced to clarify his error in Political Liberalism[v] – potentially universal, because it is the system which would be chosen by a group of citizens in what he called the ‘original position’. This is a situation in which the individuals choosing the system of justice are stripped of the knowledge of their own status in the society they are deciding upon, placed behind of a ‘veil of ignorance’ as to their vested interests, so that their choice could not be unfairly influenced. However, the problem is that these beings-without-interests are not really individuals at all, and that, as empty vessels deprived of their humanity, they would have no sense of morality whatsoever. Their care-less equality is a paradox, and the only way it can be solved, the only way they would come to a decision, is if they were made to choose by whoever put them in the position in the first place: that is, none other than Rawls himself. From what Rawls envisioned as ultimate freedom, we have suddenly moved into the epitome of dictatorship, of being forced to be free. In the same way, the drone is merely forced to be autonomous. It not only remains sutured to its dictator – the human that requires it; it also, returning to the geographical-legal principle, remains dependent upon the ground for its life. Not, you understand, for its source of energy, of survival, but for its sense of purpose. Just because the drone does not touch the ground, its bombs do. They are not faecal matter, waste simply dropped; they are limbs extended, umbilical cords like those extracting nutrients from the blood of the human race in H.G. Wells’ War of the Worlds. And just like those fiery tendrils, the drone’s source of life; its dependence on the ground, is precisely death. Even if its gaze no-longer needs to tell the human operator what it sees, this intelligence leads ultimately – via the network of targeting – to the enforced choice of who to kill. Though it finds it so easy to survive, the only reason that the drone exists at all is that we are so intent on our own impossible immortality – an immortality achieved, according to the foolish minds of men, out of the death of others. We have indeed invented this thing in our own image, yet not only so that it can materialise our dream of immortality in itself, but also so it may bring about, accelerate the mortality of others, ‘our enemies’, on our behalf. Whatever the relative freedom of the drone, and the relative lawlessness of the skies, the people killed are killed on the ground, (un)certain people fell victim to the evacuation of law from (un)certain spaces; killed at the will of certain people in certain – protected, regulated, powerful – geographies. We must not let our heads escape up into the sky while our drones continue to pummel the earth. [i] Arkin, R. ‘Ethical Robots in Warfare’. Technology Research News. 09.12.2005. [ii] In a separate post, Grayson also discusses the White House episode. [iii] Shaw, I. & Akhter, M. (2012). ‘The Unbearable Humanness of Drone Warfare in FATA, Pakistan. Antipode. 44(4), p.1498. [iv] Rawls, J. (1971). A Theory of Justice. Cambridge, MA: Harvard University Press. [v] Rawls, J. (1993). Political Liberalism. New York, NY: Columbia University Press.